Do you ever find yourself already dreading the day to start? You are not alone. But you can turn your Monday around. You can change your attitude, making Mondays a day filled with joy and happiness. 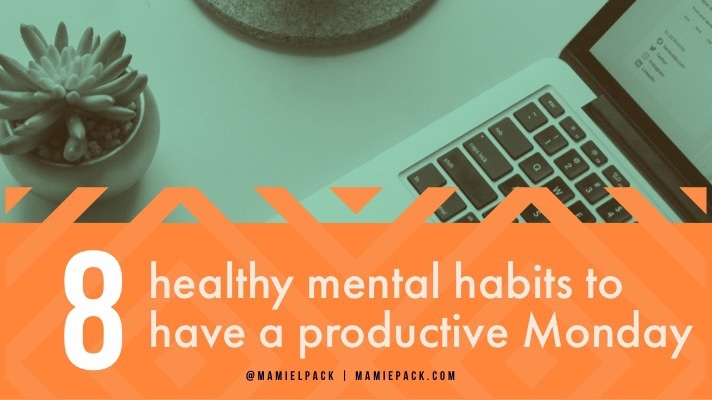 I believe creating healthy mental habits will help you have a more productive Monday and give your week the jumpstart it needs to end well. As a military wife, educator, and mom of four, here are eight habits that put in me in a productive mental mindset at the beginning of my week. Even before I allow my hand to grab my phone or allow my feet to touch the floor, I try to make it a priority to start my day with prayer. Laying in my bed, I let my first thoughts to express thankfulness and acknowledge God’s divine plan for my day. I must take this time! It can be challenging to stay God-focused for my day when I allow everything and everyone else to start filling my mental space and heart before I even get out the bed. The way this looks varies. When my children were smaller, I was breastfeeding, or recovering from an illness, how and when I spend time in God’s word looked different. I have learned to embrace grace. Some days I can study before my children are up for the day, others I need the quiet time after everyone has gone to bed for the day. Regardless, of what it will look like for you, prioritize getting in the word. Instead of rewarding yourself at the end of the week, start your week already filled with doing something that brings you joy. If it’s writing, carve time out to write. If it’s working out, go exercise. If it’s self-care, get your nails done. If it’s girl time with a friend, schedule the lunch. Whatever your “it” is put it on your schedule for Monday. Of all the things to do on a Monday, this is my biggest hurdle. According to research, if you want to have a more productive Monday, the worst thing you could do is hit the snooze button. You already start your day delaying creating a ripple effect in your day. Don’t hit that button. Adjust your night so you can get up on time. One of the worst habits I have picked up over the years is multitasking. I would eat through lunch. Check emails while on the phone. Instead of trying to do it “all,” focus on the one thing and do it well. Your stress levels will be lower, and you might find yourself working more efficiently. At the end of my day, I spend time reflecting. I allow myself to pause while remembering what went well, what I could improve, and what I need to release. You could keep a journal, a gratitude log, or even chat it out. Whatever your process, don’t rush into tomorrow without embracing all of today. I love to laugh, but with my “let’s get things done” attitude sometimes I miss the moment. Instead of rushing my kids to the next, I allow myself to be in their space. I chuckle at the corny jokes. I dance with my hubby in the kitchen. I watch a comedy. More importantly, I remind myself life is meant to be lived. Connecting with others is my favorite. I make sure to get up to pray, hug, and kiss my husband good-bye when he leaves the house at 4:30 am. When my fellas leave our home for school, we kiss, we hug, I yell “I love you” as they walk about the car. (Yep, I am that mom.) But connecting with others goes beyond the people in my home. I intentionally send a text or make a call to show I care. All of these little behaviors help me to continue fostering healthy relationships with those I love. Remember, you don’t have to do a lot, be consistent. Changing your attitude from “Monday blues” to “Monday Motivation” doesn’t have to be challenging. You just make one healthy habit after the next. Before you know it, you might start looking forward to the beginning of a new week filled with untapped potential. I love this! Especially, spending time with God part- I will spend time with God whenever I can- I praise and talk with Him throughout my day until I get to spend time reading a devotion or my Bible. I think that by giving yourself grace to have time with God at any moment rather than a specific moment relieves that stress, especially for mamas who are longing for spiritual connection. Yes! I felt bad for so long when I did not study first thing in the morning. It became a task to check off instead of building relationship. That grace factor is huge. Love tip number 3! I like the idea of starting your week with a little bit of a reward to get yourself off on the right foot! Wonderful! Are you putting something fun on your calendar for this week? Laughter I definitely think is great to start out your week. Yes! Making God a priority in any relationship is important and especially in your own personal relationship. I love these tips! Starting a week with a a joy of bag is great. I would love to incorporate that. I usually start my Monday with good breakfast. Great ideas and just want was needed on a Monday morning! Love this. So positive and true. I read this on the perfect or more likely least perfect Monday. I needed this today! Yay!! Hopefully you can start to include them one at a time. I am a firm believer in finding the funny each day. If I can do that, I can also appreciate the joy when it pops up. Great suggestions for this Monday! Laughter makes things so much lighter. These are great tips! I especially love starting the day out with a prayer and some quiet time. Me too!!! It makes such a difference. Do you have a good study Bible you use? I don’t!! I really would love to find one though! I have a few that I love. One is the Maxwell Leadership Bible. It is phenomenal. What a great list. I especially love #5 – protect your space. Oh, yes. It is so easy to just be relaxed with our calendars. What space are your protecting? Love the idea of remaking mondays into a more productive way by changing simple ways. Wonderful! What can you do to make the most of your next Monday? These are defintiely all great reminders! Thanks for sharing. Great habits! I especially like the one where you schedule something that brings you joy. Thank you for sharing! Thanks Anh! What are you putting on your calendar next week to bring you joy? This came at the perfect time!! You have started my Monday off with a bang! Thank you!! Happy Monday, so glad I found this post! Since becoming more prayerful I’ve noticed how much more peace I have. Such a great list! Prayer makes a big difference for everything. I love everything about this post especially #2! I love that you’ve given us all practical and actionable tips…I’ve pinned this because I NEED IT! Thank you!